Thinking of selling? Get a free home evaluation! 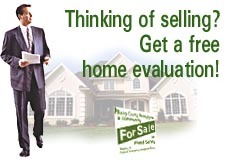 For a FREE over the web home evaluation! Local real estate agents provide free home evaluation over the 'Net. Our home evaluation is hassle-free, quick and computerized and may include detailed home sales market comparables for your own evaluation and analysis. Find links to homes for sale, home sales reports, and MLS® real estate listings. Note: In some areas an agent may be required to visit your home to provide an evaluation.